Organozinc reagents are versatile building blocks for introducing C(sp2)-C(sp3) and C(sp3)-C(sp3) bonds into organic structures. However, despite their ample synthetic versatility and broad functional group tolerance, the use of organozinc reagents in the laboratory is limited because of their instability, exothermicity and water sensitivity, as well as their labor-intensive preparation. Herein, we describe an on-demand synthesis of these useful reagents under continuous flow conditions, overcoming these primary limitations and supporting widespread adoption of these reagents in synthetic organic chemistry. To exemplify this procedure, a solution of ethyl zincbromoacetate is prepared by flowing ethyl bromoacetate through a column containing metallic zinc. The temperature of the column is controlled by a heating jacket and a thermocouple in close contact with it. Advice on how to perform the procedure using alternative equipment is also given to allow a wider access to the methodology. 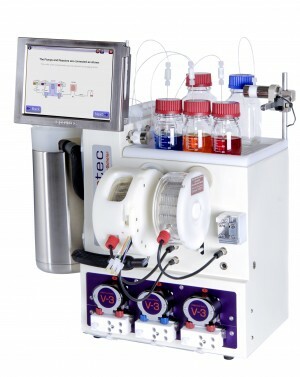 Here we describe the preparation of 50 ml of solution, which takes 1 h 40 min, although up to 250–300 ml can be prepared with the same column setup at a rate of 30 ml per h. The procedure provides the reagent as a clean solution with reproducible concentration. 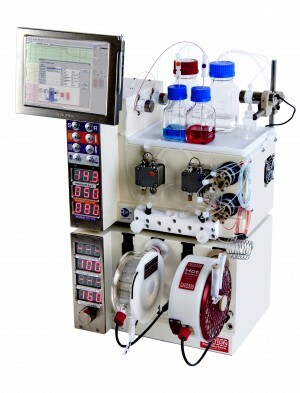 Organozinc solutions generated in flow can be coupled to a second flow reactor to perform a Reformatsky reaction or can be collected over a flask containing the required reagents for a batch Negishi reaction.